*HOT* Target - Play-Doh Classic 4pk. $0.99! Grab this new $2.00 off any 1 PLAY-DOH Compound purchase coupon of $2.99 or more and then head to Target for this deal. *This deal is listed on Target.com if you need to price match. Danskin Performance Shorts $4.99 Shipped! Grab Danskin Performance Collection Shorts with Built In Compression Shorts for only $4.99 shipped with code: NEONFIT. Milo's Kitchen Dog Treats 2 Pack $4.96 Shipped! My dog loves treats. Right now, you can get a 2 Pack of Milo's Kitchen Chicken Grillers, Chicken Meatballs or Chicken Jerky Strips for only $4.96 shipped with code: DOGGIEDEAL. Tommee Tippee Deals as low as $13.19! Looking to save a little money on Tommee Tippee products? 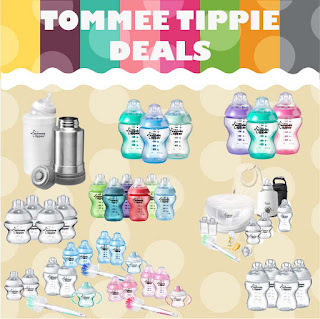 Right now, Amazon has select Tommee Tippee products up to 30% off. Jane ~ Teething Necklaces $11.99 (Retail $36) + Much More! Have a teething baby? Head over to Jane.com and grab these super cute Gummy Strands teething necklaces for only $11.99 (Retail $36). Shipping is $2.99 for the first item and $0.50 for each additional item. US only. Estimated to ship by Jul 29.